In a fun effort to keep myself working on new techniques and experimenting with styling, I’ve been working on helping a small fan art group get off the ground. The idea is simple: create fun and interesting fan art pieces as a group. It’s slow going so far, but I’m having a good time just getting a chance at some neat character designs and image making ideas! I haven’t quite finished my first entry yet (Metalhead from TMNT that still needs a background), but this drawing of Goliath from Gargoyles came together nicely. Gargoyles wasn’t the biggest cartoon on my radar as a kid, but it was there, and I remember watching it a lot. Plus the characters from it are so varied and different that it was hard to say no to making it an option for my choice of subject matter! For those interested, here’s a process gif of the image! 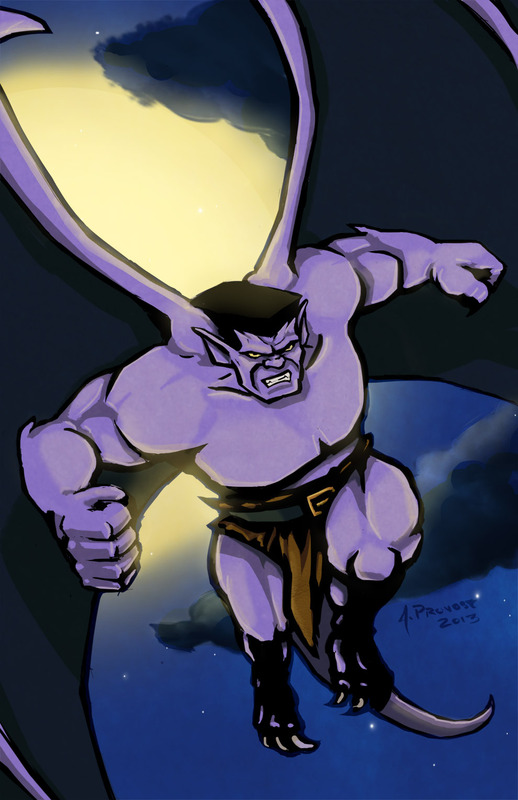 This entry was posted in Drawing, Illustration and tagged 90's, Art, Artwork, Cartoon, Cartoons, digital, Digital Art, Drawing, Gargoyles, Goliath, Illustration by aaronprovost. Bookmark the permalink.